Did you know that vocabulary growth helps kids think and learn about the world and is directly linked to their overall success at school? If your child is struggling with reading, research suggests that there will almost always be a connection to their lack of vocabulary. So, parents, if your child is between 3 and 5 years of age, now is the time to develop these critical vocabulary skills! Academic vocabulary – words that students need to know and understand in order to comprehend concepts being taught in school. Vocabulary development includes all of the above and takes the number one spot in a child’s overall literacy development! What can parents and teachers to do help? It is up to parents and teachers to teach children – either through structured lessons or through reading, writing and conversing. Learning takes place at home, at school and in the community. So, it’s important that your child develops a rich vocabulary through direct instruction, exposure to words and social interaction. Provide a variety of rich language experiences through reading stories aloud, encouraging conversations about new words, encouraging independent reading of stories and creating an environment that stimulates focus towards new vocabulary. 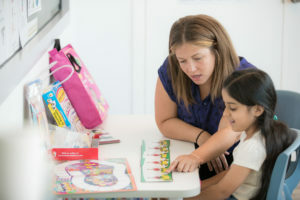 Teach individual words through direct instruction by repeating new words a few times, providing material containing new or unknown words and talking about the meanings of words, engage students in practicing new words in different contexts and talking about other words that are similar in meaning. Developing an interest in words by introducing a variety of interesting books and magazines appropriate for the ages and interests of child, and promoting word play of new words in different games. The following activities are excellent tools for helping your child link literacy to vocabulary!